Besides focusing on various communication-related issues in India, particularly those of communication rights and inclusive journalism, NCCI’s Commission on Communications and Relations has been promoting exploration of, and dynamic adaptation to, available Information and Communication Technology components along with emerging efficiency paradigms with a view to harnessing their potential for organizational and administrative effectiveness in Churches and institutions. One way to achieving greater efficiency is through the use of software solutions. In a major update to NCC Review’s manual system of managing subscribers and circulation, a software was built from the ground up to not only manage subscriptions and circulation which automates several functions of the process such as searching, sorting, tracking, generating letters and printing mailing labels, but also to maintain a digital index of NCC review articles. The software is developed with kind support from Gossner Evangelical Lutheran Church in Chotanagpur. 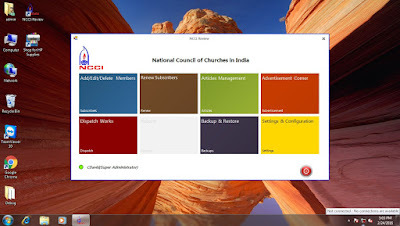 We are grateful to Bishop Johan Dang (Bishop of South West Diocese, Odisha and Moderator of GELC) and Mr. Eliazer Topno (General Secretary, GELC) for their gracious help in sending Mr. Rajesh Bhengra, their software developer for this task. Mr. Rajesh Bhengra, a committed person and skilled developer, belonging to the Munda tribe, has worked hard to develop this software. He promotes tribal youth as software solution providers, and expressed his wish to see more tribal youth acquire specific skills, enlarge their vision, break down stereotypes especially of ignorance and backwardness, and contribute in greater ways to Church and society. We are deeply grateful to him for his skill and hard work, and wish him the very best in his noble objectives especially for the empowerment of tribal youth in his region through use of technology skills. Inaugurating the new software, Rev. Dr. Roger Gaikwad, General Secretary of NCCI expressed his joy at the much needed upgrade. He said that it is good for organizations to explore and develop solutions that contribute to increasing efficiency and thereby, greater productivity. He said that, while software development is a time-consuming exercise, it must be encouraged as its organizational benefits can hardly be overestimated especially in a fast-paced work culture that requires automation and faster processing. Other persons involved in the development of this software at various levels are: Mr. Asit Balmuchu, Mr. M. T. Thomas, Ms. Neelam Gaikwad, Ms. Sunita Gaikwad and Rev. Caesar J. David. It is hoped that the NCC Review's software component will be both, internally helpful and inspiring to upgrade types. Commission on Communications and Relations, NCCI.